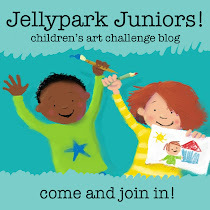 Holly was very lucky to be chosen as the winner over at the Childrens challenge corner blog last month. She won some gorgeous easter digi images from Softpencil Studios. She also gets to be the GDT for the latest challenge which is Birthday Cards. Here is what she made. This one is for her friend who's birthday it is next week. She used an image that she won recently from a day for daisies, isn't she gorgeous. She coloured her with her whisper pens and then she cut around some flowers and stuck them on. So pretty! We sure love A Day for Daisies images!!! 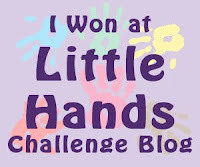 Thanks for entering at Little Hands Challenge Blog Anything Goes.....you can enter again and again with a new entry!!! What a pretty card. Thank you for entering our Crafter's Cafe Kids Challenge. The flowers add so much dimension and I just LOVE the ribbon and the frame!! 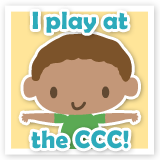 Thank you so much for joining our Kid's Challenge at The Crafter's Cafe!! 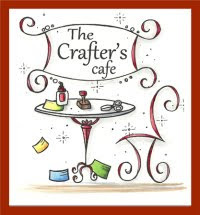 You WON the challenge at The Crafter's Cafe.